The Charlotte 49ers women's soccer team, which has won the past two Atlantic 10 conference tournaments, will try to win a third consecutive title this fall on its Transamerica Field. Charlotte, which advanced to the second round of the NCAA Tournament last season, will host the conference tournament Nov. 5-8. The women's team has also released its 2009 schedule which will feature six home games in September. The 49ers host Francis Mation on Sept. 4 and Villanova on Sept. 6. Charlotte plays at Davidson on Sept. 10 and hosts Georgia on Sept. 13, East Tennessee State on Sept. 18 and N.C. State on Sept. 20. 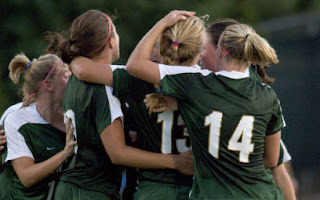 Charlotte opens A-10 play hosting Duquesne on Sept. 25 and plays at Fordham on Sept. 27. In October, the 49ers host Rhode Island on Oct. 2 and Massachusetts on Oct. 4. Then, the 49ers travel play at Dayton on Oct. 9 and at Xavier on Oct. 11. Charlotte hosts Richmond on Oct. 16 and George Washington on Oct. 18. The 49ers conclude the regular season with three A-10 road games - at Temple on Oct. 23, at Saint Joseph's on Oct. 25 and at Saint Louis on Oct. 30.